Partridge Barn is a holiday cottage nicley position on the edge of the village of Sculthorpe, near Fakenham in Norfolk. An ideal location for exploring the surrounding Norfolk countryside; and for visiting one of the many towns dotted along the North Norfolk coast. 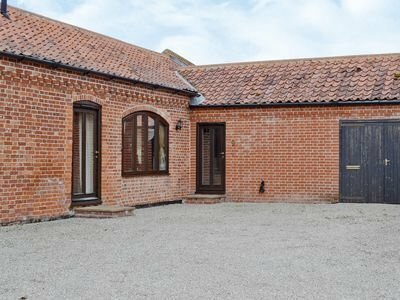 Partridge Barn is an old barn, which has been converted into this quality holiday cottage; boasting a wood burning stove for those snug nights in; and an enclosed garden for evenings in the Norfolk sunshine. All the modern conveniences you'd expect from a quality holiday cottage are provided at Partridge Barn. As well as that wood burning stove, you also get gas central heating. Your bed linen and towels are included at Partridge Barn. A TV, DV and DVD player are all included. There are French doors leading out into that enclosed garden; with further shared grounds to explore beyond that. You may want to spend your days not doing very much at all; but it's well worth the effort to get out and explore the area. The towns of Hunstanton, Wells-Next-The-Sea and Blakeney are situated along the North Norfolk coast, and all can be reached within a short drive of Partridge Barn. Or head to Norfolk's principle city, Norwich. Norwich has a large museum in the castle; and an abundance of shops, pubs and restaurants to discover. Should you have children in tow, they may well like Hunstanton with its sea-front fair; and the "Wash Monster" amphibious vehicle. The "Dinosaur Adventure Park" is also a short drive from Partridge Barn, any may well appeal to the younger children. Should Partridge Barn not be to your liking, but you fancy staying in the area around Fakenham, you might well be interested in the cottages below. All these cottages are within a few miles of Partridge Barn.